Imagine you’re a resident: Your intern year is over, and you’ve just started your first year of anesthesia training. You’re in the operating room helping to manage a case alongside more experienced residents and attendings. This particular case is unusual, and your involvement would really benefit your training. It’s an incredible learning opportunity — until you’re pulled out of the operating room to attend a basic skills workshop. This scene was a reality for UF CA-1 residents, or residents in their first year of clinical anesthesia, until this year. Responding to feedback from past CA-1 residents, the Education Office came together to plan a three-day workshop that would cover basic skills at the start of the residents’ paired period, during which a new CA-1 resident is paired with an upper-level resident, said Residency Coordinator Ricky McHugh. 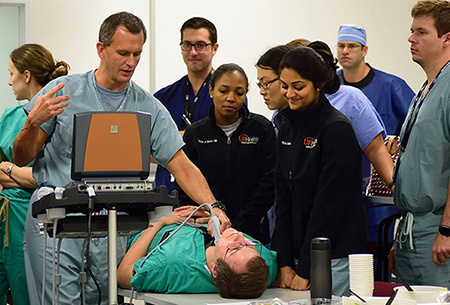 Working with faculty, residents, fellows, and members of the Center for Safety, Simulation & Advanced Learning Technologies, the Education Office planned everything from the order of the sessions to the chocolate croissants served for breakfast. On May 8 at 7 a.m., the first Basic Skills Boot Camp began. Previously, residents were entering the operating room and encountering these situations for the first time without having learned their basic skills, meaning basic skills lessons had less impact later on. On top of that, being pulled out of the OR for basic skills workshops meant they had to miss out on important educational opportunities. 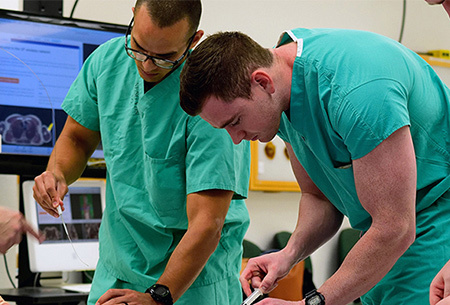 “The fact that you just know that these days are your boot camp days, just the fact that you’ve had it done before you can go into the OR and that you’re not missing those types of opportunities, that this is your set curriculum — I think that that’s a positive,” Dr. Feldheim said. Over three days, the CA-1s were instructed in topics such as anesthesiology measures and checks, emergency medicine, airway management intubation and extubation, procedural practice, and TEE imaging. This year’s boot camp was held twice — once in May and once in June — to work around conflicts with other clinical obligations, but the next boot camp will be held only once, cutting in half the amount of work the Education Office will need to put into organizing it. McHugh said she doesn’t anticipate many changes to the curriculum. “We didn’t find anything that didn’t work,” she said. She emphasized that the boot camp would not have been a success without the efforts of the many people that went into planning it, including Resident Recruitment Coordinator Kelly Spaulding and Assistant Director of Education Administration Julie Veal. “This Education Office does so much more than people realize,” McHugh said. Yet despite all the hard work and planning that goes into organizing educational opportunities for residents, she said she looks forward to repeating the experience.